Emily Early/Contributing Photographer Redshirt sophomore guard John Schurman recorded a career-high 14 points in the Bearcats’ loss to Maine. Senior guard Marlon Beck hurled himself through the air in an ill-fated attempt to intercept a pass intended for Maine sophomore guard Ryan Bernstein. He missed the ball by no more than a few inches, leaving Maine junior guard Austin Howard wide open at the other side of the court. After dodging sophomore guard Timmy Rose, Howard drained the shot. Down by one point with 45 seconds remaining, the Binghamton men’s basketball team was never able to recover. In an instant, the decision doomed the Bearcats (12-19, 3-13 America East) to a 72-69 loss to Maine. After leading by as many as 10 points in the second half on Sunday, BU suffered its eighth straight loss. The Black Bears (7-24, 3-13 AE) embarked on a 12-2 run to tie the game with 8:10 remaining. Maine head coach Bob Walsh shouted from the bench, desperate to motivate his team as it inched back into the game. His shrieking voice pierced through the otherwise quiet arena. With the game still tied and just over one minute remaining on the clock, junior forward Willie Rodriguez hit one of two free throws. But in the final minute, the Black Bears outlasted Binghamton. “I thought we found a good offensive flow for a while, but we just weren’t able to maintain it once we got it to double figures,” Dempsey said. Guards Beck and John Rinaldi were honored in a senior day ceremony before the game. After four years with the Bearcats, the duo received framed jerseys, a standing ovation and a hug from Dempsey. But after the festivities ended, the duo combined for just six points in their final game at the Events Center. Rodriguez led the Bearcats with 24 points in 32 minutes on the court. He shot a 55.6 percent from the floor, but went 0-for-2 from the 3-point range. 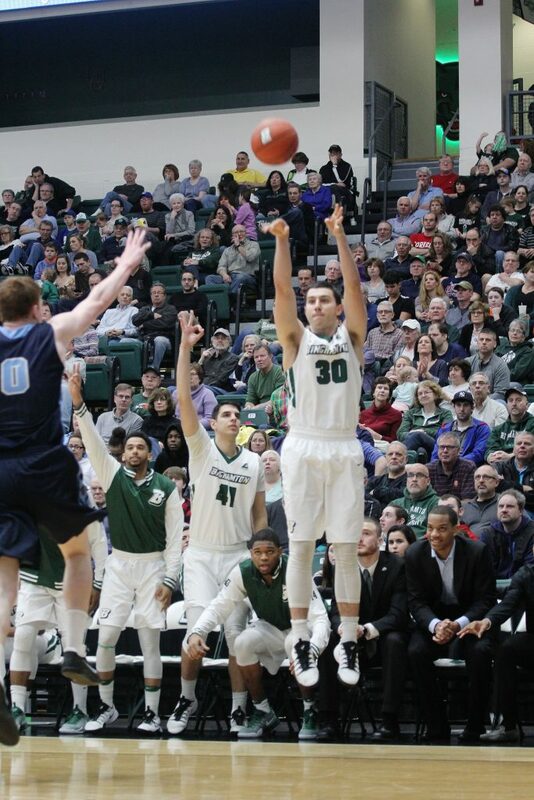 Rodriguez was followed by sophomore guard John Schurman, who tallied a career-high 14 points. Schurman’s play was a bright spot for the Bearcats; he shot 4-for-7 from beyond the arc and contributed an impressive defensive performance. Before Saturday’s game, Schurman had never scored more than five points against an AE opponent. The Black Bears were shorthanded against Binghamton after a locker room incident left a player with a broken jaw and five more players suspended. Redshirt junior guard Wes Myers punched senior forward Marko Pirovic after Pirovic declined to turn down his music. Prior to the incident, Myers was Maine’s leading scorer, averaging 16.9 points per game. Without Myers, Maine relied heavily on freshman forward Andrew Fleming, who led the Black Bears with 17 points, nine rebounds and six assists in 36 minutes. Behind Fleming, Maine shot a 44.4 clip from the field, including 42.1 percent from the 3-point range while Binghamton hit just 5-of-20. Freshman guard Fard Muhammad was sidelined against Maine due to a minor hamstring injury. He is set to be available for the AE Tournament this week. Binghamton is set to face Stony Brook in the first round of the AE Tournament on Wednesday. Tipoff is set for 7 p.m. from the Island Federal Credit Union Arena in Stony Brook, New York.